Carrots can be a nutritious addition to your diet because they are low in calories but provide important vitamins and minerals. Among the nutrients carrots provide is beta-carotene, an antioxidant that is classified as a carotenoid. This is a type of nutritional compound present not only in carrots, but also in squash, spinach, sweet potatoes and peppers. According to MayoClinic.com, beta-carotene is so named because it was first discovered in carrots. Beta-carotene is one of three known carotenoids, along with alpha- and gamma-carotene. These compounds help give foods their distinct colors and act as antioxidants, protecting your body from oxidative damage. Beta-carotene can also be converted into retinol, a nutrient essential for healthy vision, or vitamin A, which ensures proper bone development and reproductive system function. Carrots are a rich source of beta-carotene, as each 100 g serving of raw carrots provides 8,285 mcg of this nutrient. According MayoClinic.com, you need just 1,800 mcg daily to maintain healthy levels of vitamin A, so 100 g of carrots provides more than enough beta-carotene to do so. Beta-carotene is fat-soluble, meaning that you need to eat it with a source of fat in order for your body to properly absorb the carotenoid. 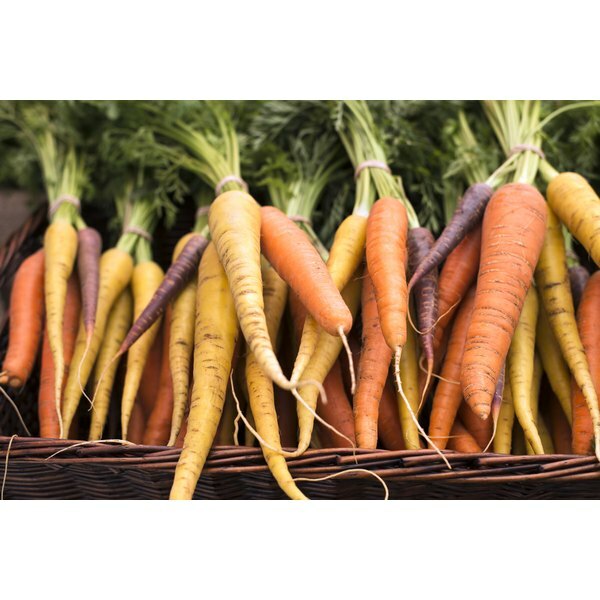 MedlinePlus reports that beta-carotene has been suggested as a possible treatment for a wide array of conditions, although research indicates that it's not effective for all of these treatments. The site notes that beta-carotene is effective for treating sun sensitivity caused by a certain blood disorder, and that it may be effective for reducing the risk of breast cancer, macular degeneration, sunburn, ovarian cancer and exercise-induced asthma attacks. Carrots provide a number of nutrients other than beta-carotene. They are rich in fiber, with 3 g in each 100 g serving, as well as potassium, with 320 mg. That's 16 percent of the daily suggested intake of this electrolyte, which promotes proper function of your nervous system, muscles and heart. Carrots are high in vitamin A and alpha-carotene, yet they are low in calories, as 100 g of raw carrots contain just 41 calories.